The positions and titles of all the individuals listed above were current at the time they participated in the art selection process. 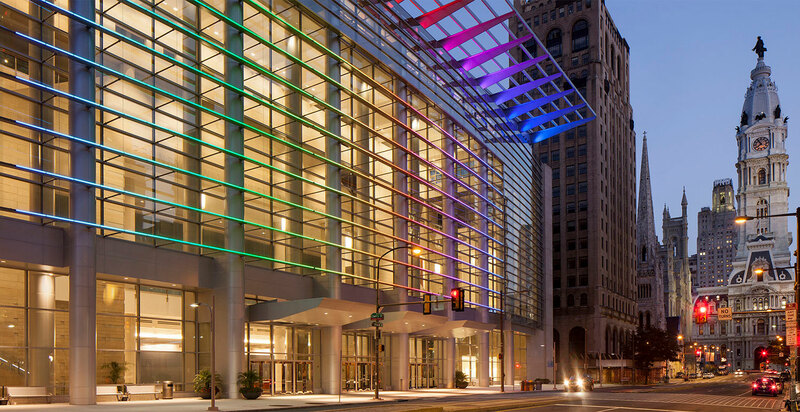 In 2011, the Pennsylvania Convention Center expanded its building by 62 percent, totaling the Center’s footprint to 2 million square feet of space and making it the 14th largest facility in the nation with the largest Ballroom in the Northeast. The budget for the Center’s West Wing Expansion included funding to enhance and extend the facility’s existing Fine Arts collection into the expanded space. A total of $1.5 million was approved by the Commonwealth of Pennsylvania to be spent on a Fine Arts Program that included the selection, the procurement, and the installation of artwork in the Center’s Expansion from 13th to Broad Streets. In 2014, the Pennsylvania Convention Center launched an “Open Call for Art” to Pennsylvania’s fine arts community to aid in acquiring original artwork to adorn the Center’s West Wing Expansion. With administrative assistance from the Pennsylvania Council on the Arts (PCA) in Harrisburg, the Center formed a two-tier review process with both a Blind Jury and an all-volunteer Art Purchasing Committee to assist in the selection of original artwork by Pennsylvania’s most inspiring artists. Both groups – the names of such individuals are listed to the left – were compromised of prominent art professionals throughout the entire Commonwealth of Pennsylvania. The Blind Jury, whose names were not disclosed until after the project was finished, completed the initial review of all the artist submissions and made purchase recommendations to the Art Purchasing Committee who then ultimately advised the Pennsylvania Convention Center on which artwork to acquire. To ensure that a very public, meaningful, deliberate, comprehensive, and thorough art selection protocol was followed, members of the Jury and the Committee were all required to disclose any potential conflicts of interests before viewing any artist submission. The Pennsylvania Convention Center proudly presents its West Wing Art Collection.